THE sister of mother-of-three Ruth Maguire has called for safety barriers to be erected at the waters edge to help prevent further tragedies. Ms Maguire, a 30-year-old health assistant, went missing on her friend's hen night in Carlingford, Co Louth on March 16. A candlelight vigil was held in Carlingford last night to remember the young mother, as well as Martin Patterson and Shane McAnallen, who were killed in a car crash in the Louth town on St Patrick's weekend. 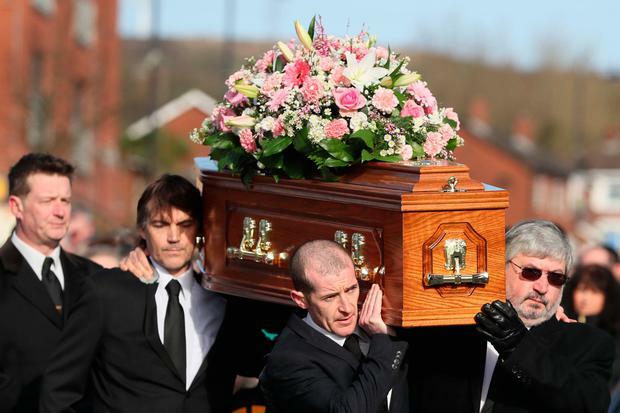 The coffin of Carlingford drowning victim Ruth Maguire is carried by her partner James Griffin (left) and father Malachy, as it makes it way to Saint Vincent de Paul church, Ligoniel, Belfast ahead of her funeral. Speaking at the service, Ms Maguire's sister Rachel Wilkinson said it "makes sense" to put barriers in place. "I think having a barrier there and closing it at night time so no young ones can walk down makes sense. I've a small child, who is three and light as a feather so one gush of wind and he'd be in the water," she told LMFM. "It's not just for young ones who are coming down after having a few too many, it's for everyone." During the service, parish priest Fr Brian MacRaois "prayed for their grieving families in this time of shock, loss and pain". Ms Maguire, who was originally from north Belfast, had been out with a large group as part of a hen party when she said she decided to go home. She last posted a photograph on social media of Carlingford Lough on the night she went missing. Friends are now trying to raise money to help her partner Jim and their three children Tyler, Oliver and Lydia. “Following a recent and most unfortunate tragic accident imaginable Ruth Maguire lost her life," friend Leighann Flood said on the Go Fund Me page set up in Ms Maguire's name. "Along with her fiancé Jim, they worked tirelessly to give their children the best that they possibly could in life. The page has so far has raised €5,259.52. Hundreds of mourners gathered at her funeral on Saturday, where the bride-to-be was buried in her wedding dress. A guard of honour of children and adults from Ms Maguire's GAA club, Bryansford GAC in Newcastle, where she volunteered as a coach, stood outside the church. Friends have described Ms Maguire as "the most loving, hard-working and caring mother to her three beautiful children" who, along with her partner, "worked tirelessly to give their children the best they possibly could in life". She was laid to rest at Carnmoney Cemetery.